Nikon’s W-Nikkor 3.5cm 1.8 – Is This The Best 35mm Wide Angle Ever Made For A Leica? 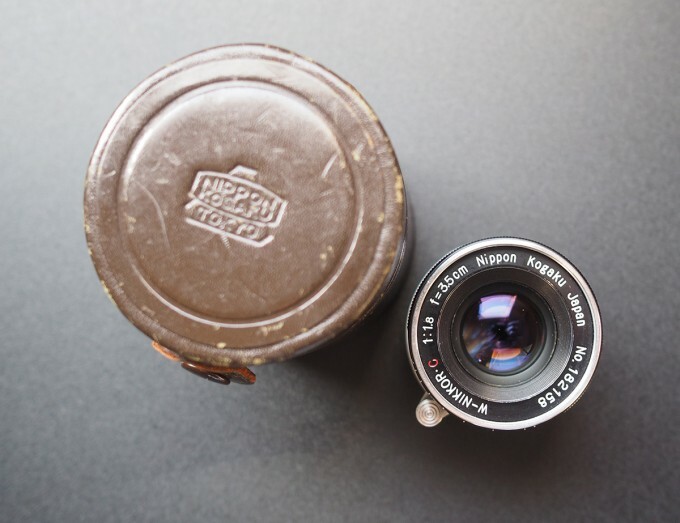 In 1956, two years after the introduction of the Nikon S2, Nikon delivered a stunning new 35mm (3.5cm) lens of 7 element 5 group design with a maximum aperture of 1:1.8. It employed rare earth Lanthanum glass to improve spherical aberration and curvature of field, enhancing both sharpness and image flatness. This Nikon mount lens used a convex shaped rear lens element larger than the front, which minimized the spherical aberration and coma problems usually associated with fast wide angle optics. It was one in a series of excellent fast optics produced by Nikon for their rangefinders, following the 8.5cm 1;1.5 in 1953 and the 5.0cm 1:1.1 in 1956. The 3.5cm 1.8 was Nikon’s shot across Leica’s bow, given Leitz’s preeminence in wide angle design, incorporating the highest technology of the period to produce optics as good, or better than, the Leitz offerings. The W Nikkor 3.5cm 1.8 was met with rapturous reviews by Nikon photographers; almost all rated it superior to the Leitz offerings at the time, and most claimed it better than the f2 Summicron and the 2.8 Summaron both introduced by Leitz 2 years later in 1958. Given the reception of the Nikon Mount 3.5cm, in 1957 Nikon briefly decided to offer the lens in thread mount for Leica rangefinders. While optically the same as the Nikon mount, the design of the Leica mount model is slightly different. 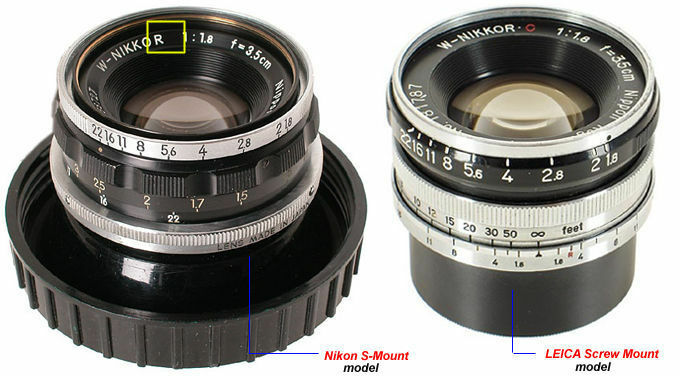 The front element is flat, and the focusing ring is also flat without the scalloped-design on the Nikon S-Mount version. 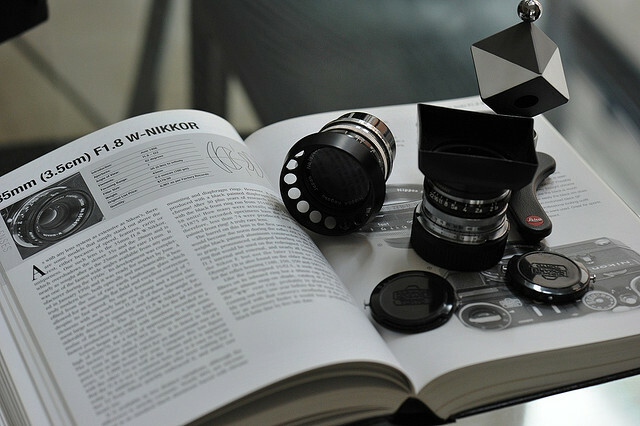 While all LTM copies are coated, Nikon omitted the “C” designation on a few hundred of the latter produced lenses. These non-designated C lenses command premium prices. While Nikon produced 6500 of the Nikon S mount 3.5cm lens, it produced a very limited run of approximately 1500 of the Leica mount. The LTM W-Nikkor 3.5cm 1.8 exhibits extremely high resolution and high contrast in a lens faster than ƒ2. The actual resolution of this 60 year old lens is nothing short of astonishing. Even more astonishing is, that in contrast to other lenses from that era the W-Nikkor retains this kind of performance over the whole frame.The Nikon lens is so impressively good it took Leica 40 years to match its optical excellence with the $5000 Aspherical Summilux. The W-Nikkor3.5cm 1.8 Leica mount lens was then, and remains, a rare and much sought after lens, and comes up for sale rather infrequently. If you want to try one on your Leica, if you can find one, you can expect to pay $1600-$2000 for a BGN grade copy, with prices escalating significantly for exceptional copies. Ironic, then, that maybe the best 35mm focal length lens ever produced for the venerable Leica was made by Nikon. This entry was posted in Cameras, Leica, Leica Rangefinder, Uncategorized and tagged Leica Summicron 35, LTM, Nikkor 3.5cm 1.8, Nikkor LTM on February 6, 2013 by Leicaphila.